Victor is the name of our self-converted van! 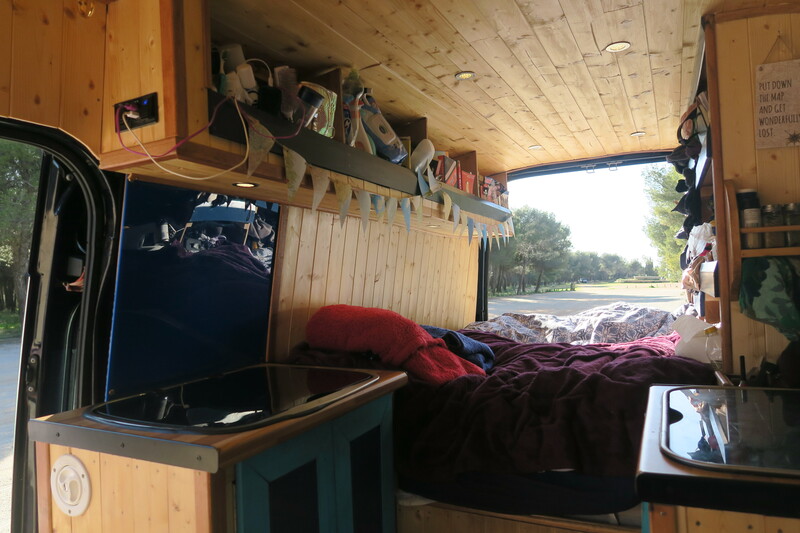 Some of you may have an idea of our van set-up already from a couple of photos I've posted on my Instagram, or on Ross's Insta account, but I felt it was time to give a proper little tour of our home on wheels! I'm planning on doing a tour video on YouTube in May (when I will finally have enough internet to upload a video), so if you have any conversion questions please comment below and I'll get Ross to answer them! Ross did the entire conversion himself (apart from fitting the two long windows on the side of the van) and was entirely self-taught. I'm so proud of everything he has achieved - the van is perfect for us and has truly become a home. By now, you should all know how Victor the van looks from the outside! Nothing too fancy, just a dark blue Ford Transit, with a 3.2 litre engine, rear wheel drive and 6 tyres. So that you can imagine her size: she has an extra high roof (she's 2.7 meters high) and an extra long wheel base (she is 6.5 meters long) and is 2 meters wide. She has two windows on either side in the back - one on the sliding door (pictured above), which can slide open partially, and one on the other side that doesn't open. 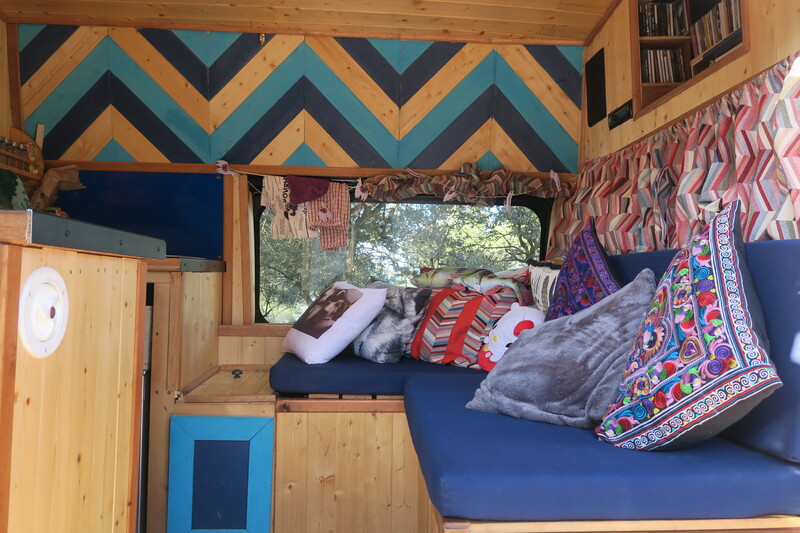 There are also windows on the back doors of the van, as well as a ladder so that you can reach the roof where the solar panel is. Our van is a left hand drive which Ross imported himself from Amsterdam so that driving in Europe would be easier but this did make it more of a pain to register in the UK with the DVLA... If you fancy a rant from him about the process then he is always obliging! The door that you can see open in the photo above is therefore my seat in the passenger side! I can drive but insuring me on the van was ridiculously expensive, so we left it to Ross. Without any further ado, let's be nosey and take a look at the innards of Victor! This is the view you get from opening the side sliding door of the van. It's a big step up from the ground and some of our shorter guests have struggled to get used to it! The chevron feature wall was inspired by the interior of a bar we visited in Birmingham, UK, and was a bit of a bugger to do but looks really effective and ties in with our blue colour scheme. You can also see the window on the drivers side here. 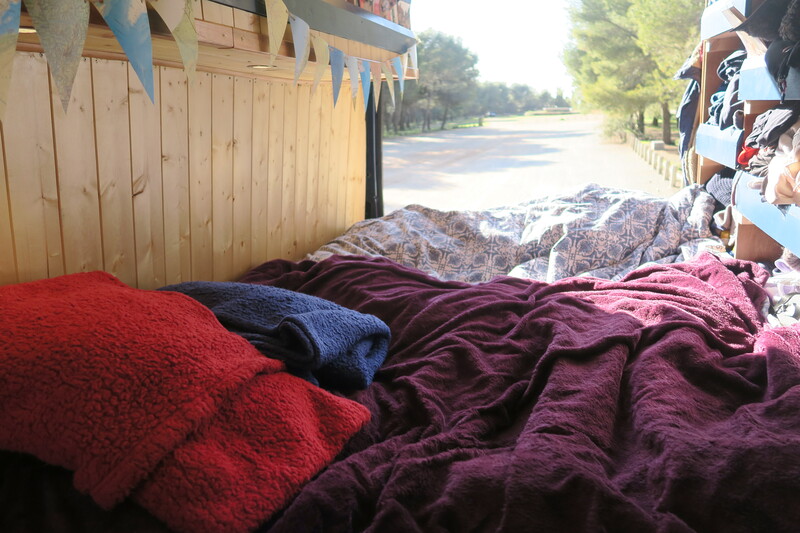 I made six curtains for the van all in all, to cover the two big windows at the side, the two back door windows, one curtain to divide the back from the front driving cabin, and one more to split the back in two for when we have guests so that there is more privacy. I made them all with lovely chevron material (you may notice a theme) that I found at our local rag market in Birmingham. I used my mum's sewing machine back home, as well as large helpings of her wisdom, and surprisingly they're still looking great after 5 months of travels! For the big blue sofa cushions, Ross bought three big pieces of foam cut to fit the sofa he built and I sewed the covers for them at home, complete with poppers on the underside so we could wash them - in theory anyway! I've been too scared to wash them yet, in case they all unravel into nothing! I don't have that much faith in my sewing skills... Ross constructed the sofa so that the seats lift up and we can store stuff underneath it. 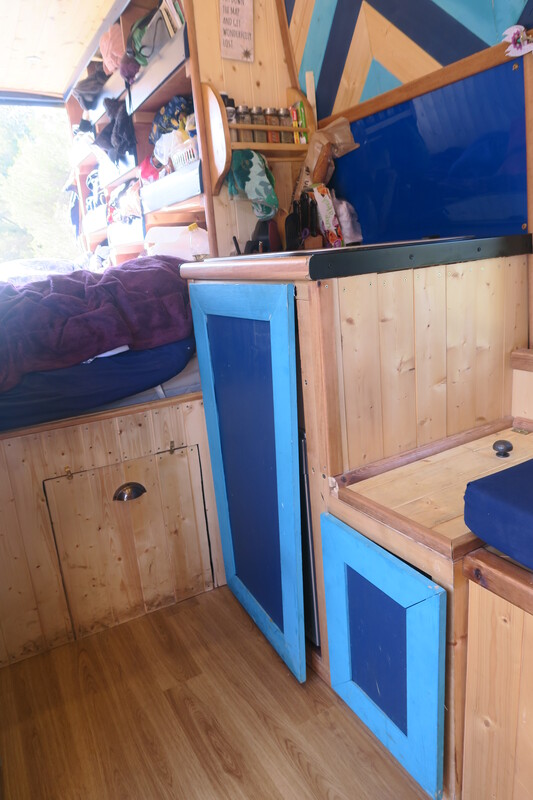 It also pulls out into a small extra bed for a guest to sleep on. 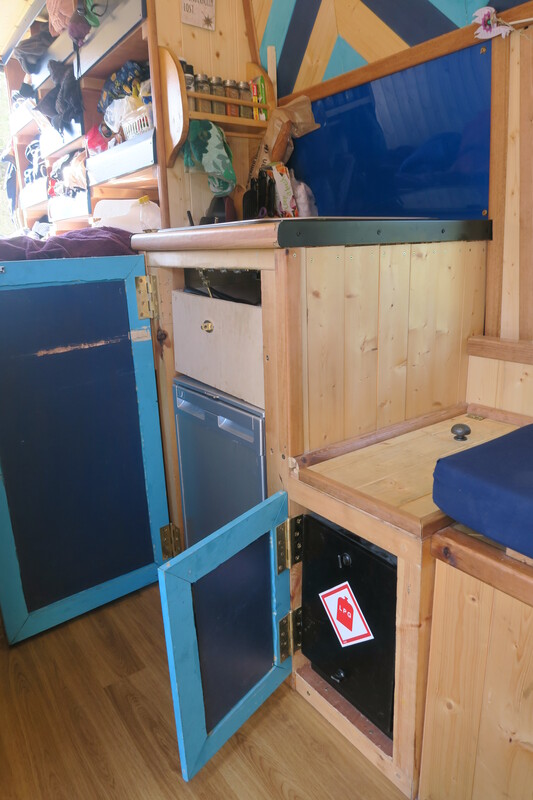 As well as storage, our extra battery is under this corner sofa, which is charged by both the engine and the 120W solar panel on the roof. This battery allows us to charge our phones via USB cables, as well as powering the lights, the sound system and our fridge. Ross loves music and has accumulated quite the CD collection over the years. 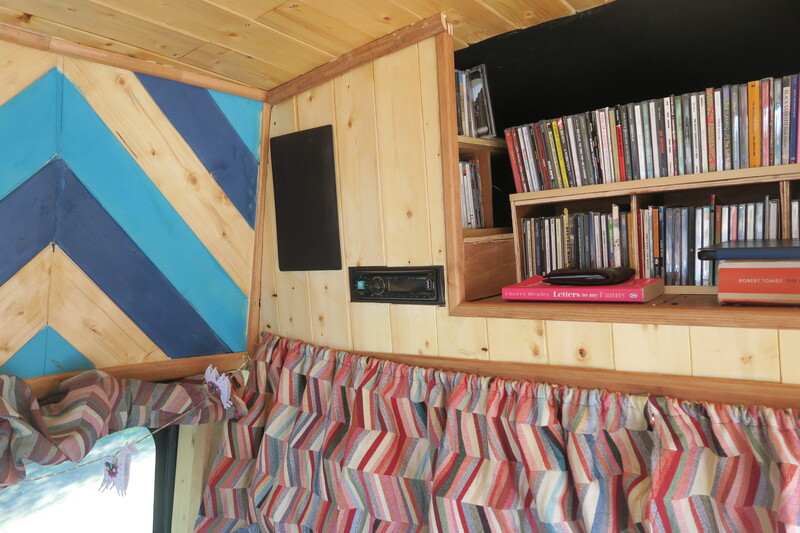 I don't think it even occurred to him to leave them all at home so he fitted this radio/CD player into the space above the cabin, with a big space for his CDs in the middle of the speakers. The CD racks were fiddly to fit, as was the cladding around the stereo but now they look like they belong there! He still couldn't fit even half of his CD collection in to the van but at least he has his favourites. We like to blast out some music at the end of a long day, and it's perfect for listening to a podcast or connecting to the laptop while watching a movie for enhanced sound. It was definitely worth the extra effort. The box shape under our bed, with the handle, pulls out to reveal our portaloo. We try to do wild toilet trips whenever we can but obviously in the daylight and in more populated areas this is very tricky! 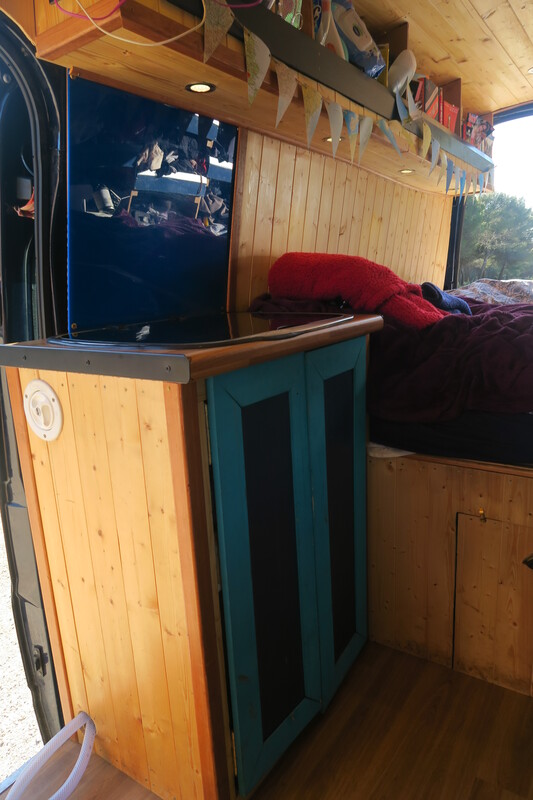 It was kindly lent to us by his dad and has made van living much nicer. I'm glad I forced Ross to take one with us! Behind the portaloo and under the bed is more storage space, which is accessed by holding up the mattress and opening a hatch. In here we keep the awning for the van, a fire bowl (which sadly we haven't been able to use yet), the chemicals for the portaloo and all the stuff Ross needs if the van breaks down. Pretty much all of our van is covered in wooden cladding and Ross often jokes that an entire forest has gone into Victor! He's probably not too far off... Behind the cladding, sits lots of insulation that Ross popped in, and we were very glad for it on our cold nights in France over winter. 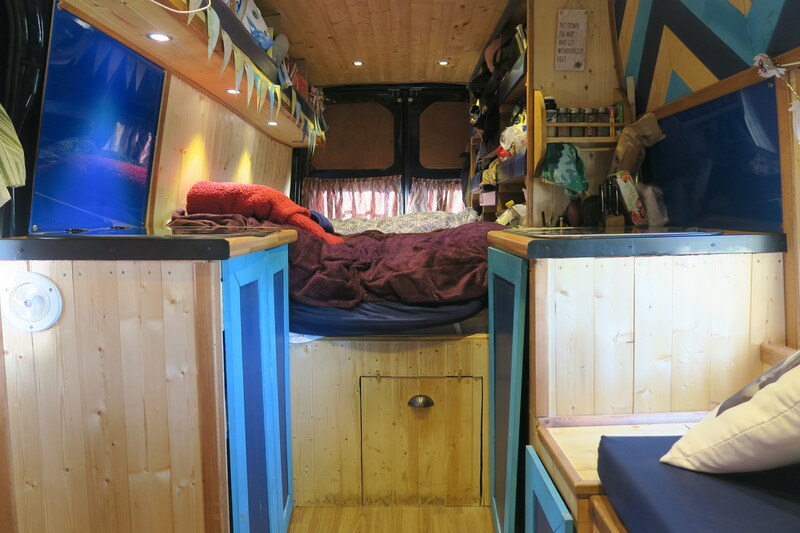 I personally love the effect of the light wood throughout - it makes the van feel much less like a metal box! Eight lights run down our ceiling in pairs and then we have four more under our raised shelves. They are LEDs and are touch sensitive so you just tap them gently to turn them on and off. Easy to reach and much easier in our van than to go to a switch, it also means we can light up specific parts of the van, depending on what we are doing. In this cupboard, next to the sliding door, we have our water tanks. One is for drinking water and holds 70 litres whilst our grey water tank, for dirty washing up water, holds 14 litres so we have to empty it every few days. We generally fill up the drinking water tank via a hose but sometimes the taps we use don't have a connector. This means that we have to use a funnel instead and fill the big water tank up with our 5L water bottles. We don't have running water/taps in our sink, which sits on the top of this cupboard, so we fill up our bottles and use water from these to wash up/drink from/cook with. The sink has a cover over it so it doubles as a surface we can prepare food on. 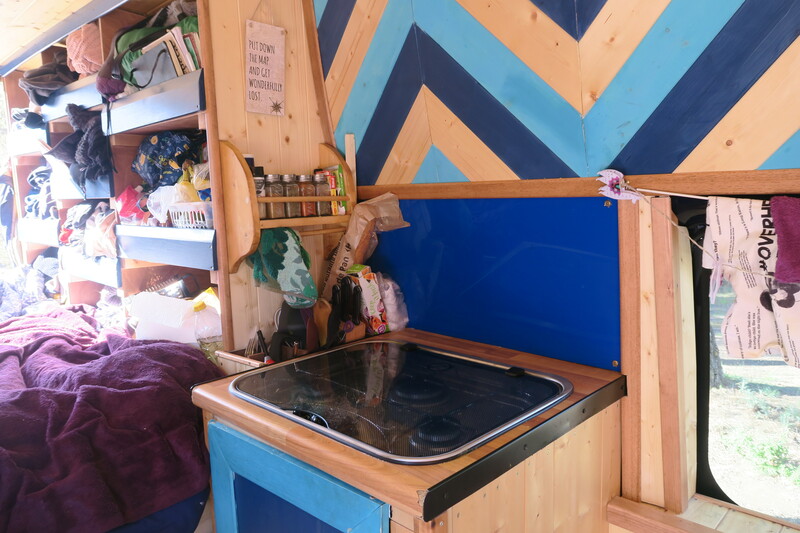 The water tank cupboard and the cupboards on the other side of the van, which contain our gas tank, cooking things and fridge, were made by Ross and painted blues to match our chevron feature wall. They've been pretty battered since we fit them in... Occasionally the toilet hasn't been put away properly and has shot out while we were driving, taking out the cupboard doors. But they've survived and I think they look quaint nevertheless. The floor is a vinyl laminate but has been perfect for all we've put it through - spilt food and water, sand and mud. It is so easy to clean and sweep, with no staining and it goes really well with the rest of the wooden interior. A lot of campervans have carpet but we thought it would be quite difficult to clean. In the little cupboard is our gas tank, fitted safely inside our gas locker. The gas tank contains LPG for our hob, which you can fill up in many petrol stations. On the top of this little cupboard, you can see a little knob. This lifts up to give a little nook behind the gas locker, which we store our spare blankets in, which are very neccessary in the winter as we don't have heating in the van! In the bigger cupboard next to it, we have our fridge, which is the perfect size for us, and a drawer which contains our saucepan, frying pan, wok, chopping board and fire blanket (which hopefully we will never need to use)! On top of the fridge cupboard is our 3 ring hob which we cook all of our dinners on and, like the sink, it has a cover over it for more surface space when we aren't cooking. You can also see our food and clothes nooks next to the cupboard. There are three columns here, split into 10 nooks altogether (we have A LOT of nooks in this van). The three in the column closest to the hob are for food storage and for our plates and mugs. The rest are for our clothes, suitable for all types of weather! We bought enough clothes so that we can last about 2 weeks before doing laundry. 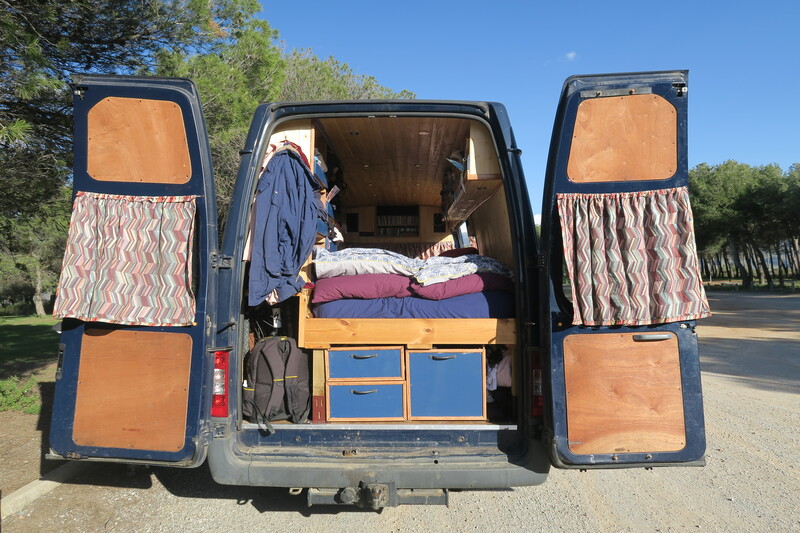 It's nice to have so much storage space as we've seen other vans that don't have so much and have had to compromise on what kind of clothes they can bring. In between the hob and the food nooks are our cutlery nooks. They're split so we can store our different utensils easily, as well as our mini vacuum cleaner which has become very useful. 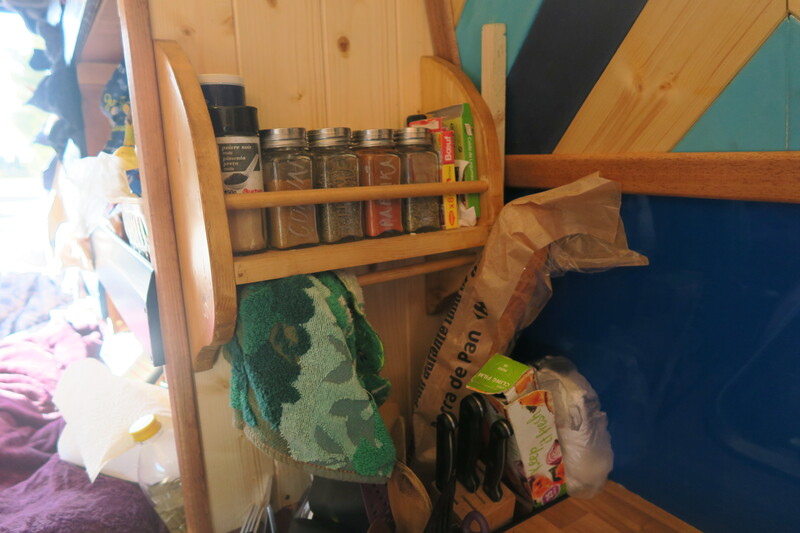 Ross more recently made this beautiful spice rack as well, so that we have more shelf space in our food nooks for veg and tins. It's really usefully situated next to the hob for cooking, and he's also added a little tea towel rack! On the side of the sink and water tanks, we have a raised shelf that runs over the bed. You can see that over the sink, we have some outlets with USB cables to charge our phones. The shelves are split into 4 sections. Closest to the sliding door, we have our toiletries section, and next is for storage of our cleaning products, and the last two sections are for our books. 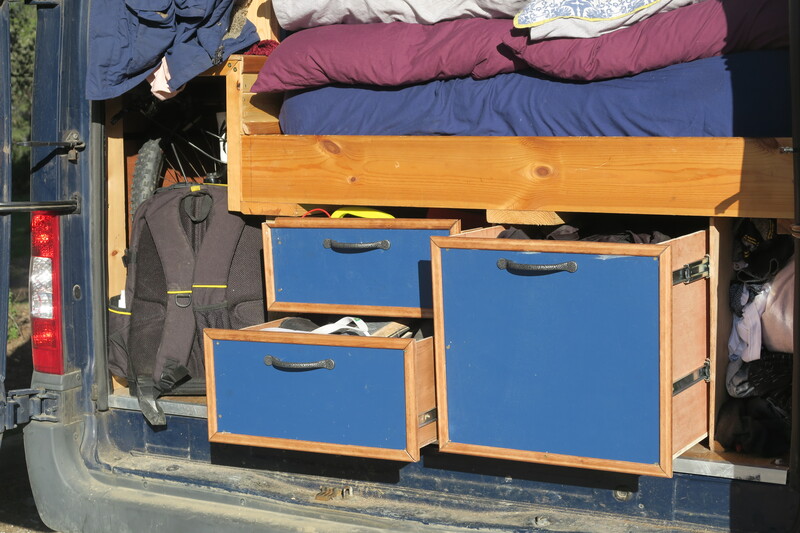 Ross built the bed and the shelves/nooks so that they all fit together perfectly, maximising all the space in the van. The bed is a small double, and we invested in a nice mattress so we are comfy at night. I have hypermobility syndrome so having a decent bed is especially important for my joints and I'm very grateful for it after a day of walking! You might also have noticed some decorations hanging in the van: I bought some llama fairy lights before we left, we got more fairy lights from Ross's best friend Sophie, and we got the wonderful map bunting from my best friend Rosie. We also got some cute knick-knacks from other kind friends - a map dangly with "Put the map down and get wonderfully lost" on it and another which says "All you need is love... and a dog!". This is very apt! This is the view of the van from the back! On the back of the nooks, you can see we have hooks (nook hooks!) up for our coats. Below this, we have a big space that extends all the way past the bed and to the cupboard with the fridge in! In here, we have Ross's bike, his big toolkit, and three camping chairs for when it's hot and sunny. We also keep our Hozelock portable shower in there - it's a pump up one and is one of the best things we bought for the van, along with the fridge and portaloo! On the other side of the drawers, we have a little space we call the laundry nook and we fling all our used clothes in there until laundry day. The drawers in the back were only made by Ross very recently and they've done wonders for our storage. Before the drawers, everything was shoved into the back but now it's neatly compartmentalised. We have one drawer for Ross's bits and bobs for fixing things, one drawer for our shoes, and one more for towels and our hiking rucksacks. Victor the van has everything we need and more, and we've adapted to van living quite happily now. That concludes the van tour so make sure to send me your questions and what you think about the van! Could you live in this? 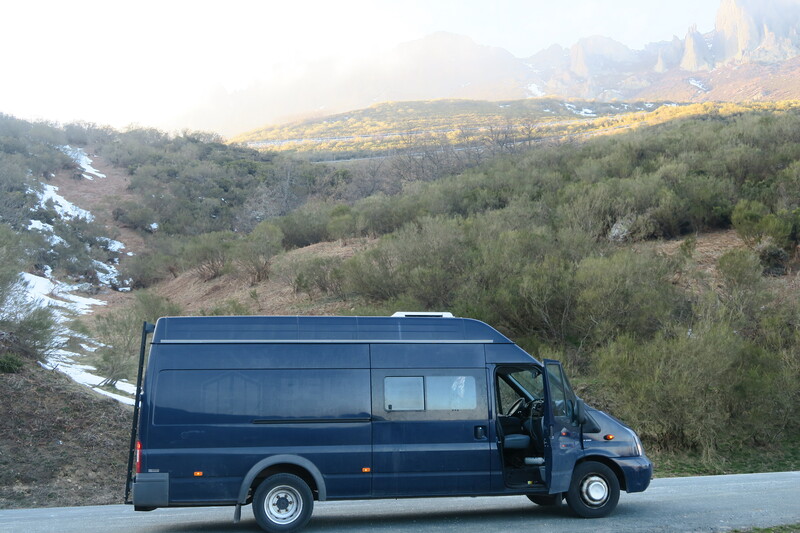 Are you thinking about converting or travelling in a van?? Could you write a blog post with the word nook in this many times?? ?